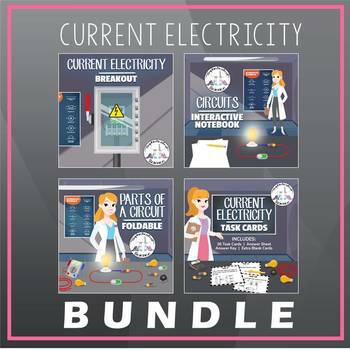 This current electricity activity includes eight escape room breakout challenges, which can be implemented in a variety of ways. • As a homework activity to assess student understanding of the concepts. Each activity can be completed individually or in conjunction with one another, depending on the time available in your planning. The challenges could be used as individual, pair or small group activities. A detailed and thorough teacher instruction page has been included. This is a print-and-go resource, requiring only pencils or pens, scissors, glue sticks. This 7-tab interactive flipbook introduces students to circuits including parts of a circuit, schematic symbols and diagrams, series circuits, parallel circuits and properties of each. This 8-tab interactive foldable examines the parts of circuits including names, descriptions, and schematic symbols. Parts featured include wire, switch, buzzer, light bulb, cell/battery, resistor, ammeter and voltmeter.